A crucial question for the Spanish economy is why it suffers a level of unemployment that is much higher than the rest of the economies that surround it. Obviously, it is a question with no simple unequivocal answer, for surely there are many factors that make its unemployment so high and permanent that it remains high even in periods of high growth. We can assume that most conventional economists are partly right when they say that our labour market has important limitations from the rigidities caused by wage setting policies — the types of contracts, discrimination or even factors such as mobility or working time regulations. But it is impossible that such things, even if they were more exaggerated than in other countries (and it is not clear that they are) in themselves explain the unemployment gap with with Spain’s neighbours. In my opinion, it is more likely that Spain’s high level of unemployment is due more to the weakness of its domestic market. I am among those who think that the Keynesian component (which says that unemployment is caused by a lack of demand for goods and services) is more determinant of high unemployment that the liberal explanation (which considers that rigidities in the labour market rise push up wages too high, which in turn cause unemployment, and thus this is therefore voluntary, as it would automatically disappear if workers accept lower wages). I even think, as Michael Kalecki pointed out many years ago, that unemployment has to do with politics: it suits big business because thanks to unemployment they have more bargaining power over workers. And even with other structural features of the capitalist economy which I will not discuss further here. In any case, having rapidly surveyed these causes, I would like to discuss here another explanation that no-one wants to hear: the high unemployment we have in Spain is related to our membership of the euro. In recent years, since it entered the European Union and more specifically the monetary union, Spain has registered a steady deterioration in its balance of payments, with very high external deficits and debt and with substantial capital outflows. The country only had a current account surplus in 2012 and 2013, due to falling exports, while it registered deficits of around 10% of GDP in the years before the crisis. According to the IMF, Spain (1.4 billion dollars) has the second highest foreign debt in the world after the US (5.5 billion), but the US debt represents 34% of GDP, and Spain’s for 103%. Arguably the conditions in which Spain joined the EU and the euro and both the political and institutional set up of both haves caused us a kind of continued balance of payments crisis. And in this situation, any economy has two possible answers to improve its external balance. One is the adjustment in the exchange rate of its currency through devaluation and the other is to reduce labour costs. Being part of a single currency, Spain does not have recourse to the first solution and so had to make a steady salary devaluation on the basis that its economy must be more competitive to cope with its balance of payments crisis. Researcher Patrick Artus of French bank Natixis has shown that if the adjustment to a balance of payments problemsis carried out by wage devaluation (as is happening in Spain) unemployment rises further and longer than if the adjustment is performed by means of adjustments in the exchange rate. He has compared the experiences of countries that adopted adjustments using the exchange rate (Spain and Italy in 1992-93, Mexico in 1994, Korea and Thailand in 1997, Brazil in 1998 and Argentina in 2001) with others carrying out adjustments via wages ( Spain, Italy, Portugal, Greece, Ireland in recent years and Germany after 1990) and his conclusions are obvious. In principle, both methods of adjustment have two initial effects that one might think would have a similar impact on unemployment. One positive, increasing competitiveness by lowering costs and so boosting foreign trade. And another negative, reducing real incomes by increasing the price of imports or lowering income by cutting wages. However, the data show that when the first type of adjustment occurs (currency exchange rate) the subsequent rise in the level of unemployment is relatively low and transient, because it is reduced again in one or two years. That is, the first positive effect is greater than the second negative effect. However, when adjustment is through wage cuts, unemployment rises to a much higher level and stays there for at least five or six years. The negative effect is greater than the positive. Adjustment using the exchange rate affects all economic actors while salary adjustment focuses on employees. He also notes that if there is rigidity in prices of outputs (as in Spain) and these do not fall when wages are reduced, downward wage adjustment does not result in greater competitiveness but only in higher profitability. While adjustment using the exchange rate immediately lowers the prices of our exports, making them more competitive. In summary, it appears that our membership of the euro has two deeply negative consequences that are inevitable given the conditions in which the single currency was designed. On one hand, the existence of deep asymmetries that there is non desire to address and which produce deficits and foreign debt in peripheral economies in a mirror image to the surpluses of the most powerful economies. Furthermore, the inability to use any another type of adjustment than wage devaluation to address the degradation of the terms of trade of deficit countries such as Spain. A adjustment however, that in the end does not achieve adjustment as it depresses domestic demand, decreases sales, increases unemployment and profoundly and durably weakens the economy. But yes, the huge market power of large Spanish companies allows them not to cut prices in line with wage devaluation and so increase profitability. The conclusion is clear. 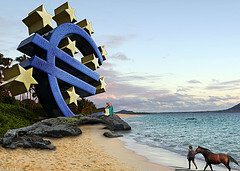 If we belong to a euro that does not address or resolve the asymmetry between economies, specifically between Spain and Germany, which in terms of foreign trade act like a mirror image, we are doomed to use an adjustment mechanism that causes unemployment and all the consequent disastrous effects. The poorly negotiated EU entry and the failure in entering a single currency designed to strengthen a surplus economy like Germany, which by definition has to generate deficits in others, has put our balance of payments in intensive care. But the remedy, salary adjustment, is worse than the disease. Posted in: Earnings, Economy, Europe, International, Prices/Inflation, Trade. Why are the deficit and the balance of payments not even being debated? What is leftfutures.org obsession with anti-EU anti-Euro stories from France and Spain? The last one was from a French conservative economist. This one is an obscure, Podemos supporting Spanish economics professor best know for writing an article in El Pais (Spanish equivalent of the Guardian) in March 2013. In an article entitled “Germany against Europe”, he compared Angela Merkel with Hitler: “Merkel, like Hitler, has declared war on the rest of the continent now to guarantee its vital economic space”. One has to call into question someone with such lax judgement as this.